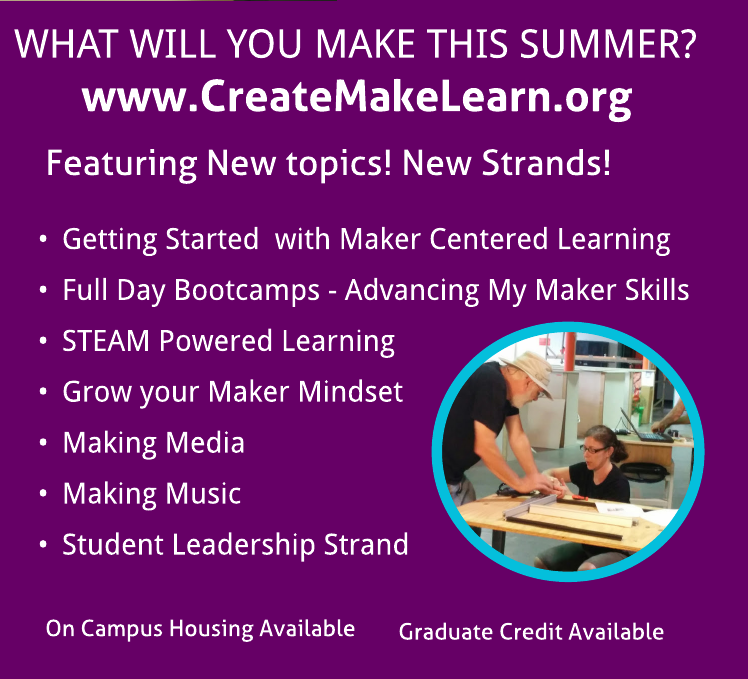 Subscribe to this blog to get new learnings ideas, discoveries, and inspiration from the CREATE MAKE LEARN community, along with updates about our upcoming Summer Institute and Workshops. One of the favorite activities in many makerspaces is working with paper circuits. With some LEDs, a coin cell battery, and a little copper tape, students can gain skills and understanding that will provide a foundation for more advanced making. Educators attending the Create Make Learn Summer Institute are fortunate enough to be able to learn from one of the best -- Maker Artist Educator - Jill Dawson! And the coolest thing for us is that Jill started her journey to becoming a paper circuit expert at one of our first Create Make Learn Institutes. I still remember the transformation that happened after Craig empowered her with a soldering iron. The light bulbs went off left and right filling her creative mind with possibilities! She started to to use paper circuits in her artistic endeavors from creating illuminated greeting cards and circuit boxes to amazing book binding projects. As Jill grew her skills and confidence with soldering and electronics, she started to see how paper circuits might fit into various subject areas. Science and Arts integration was an obvious entry point! Not only could adding lights to paper open up possibilities for design in student art work, it also help them apply science concepts that they had been introduced to in fourth grade. Even though working with circuits is introduced in grade 4 in many schools, few students get a chance to play with circuits outside their science labs. Paper circuit maker activities give students and makers a chance to apply science concepts as they imagine ways to apply copper tape and LEDs to add design elements to their art, illuminate a piece of text, or create a model. It did not take long for the Create Make Learn community of educators to invite Jill as an expert and collaborator to integrate paper circuits in a variety of content areas. Working in collaboration with Jill, art educator M.K. Monley and students from Thatcher Brook Primary School designed paper circuit bug lanterns for the town’s annual River of Lights festival. Students is Ms. Garrison’s language arts classes at Colchester Middle School worked with Jill to integrate paper circuits into their story-telling, as part of a larger exploration on multimodal writing. Jill also inspires teachers to give Paper Circuits a try through her presentations at conferences and her annual workshops at Create Make Learn Summer Institutes. Inspired by their work with Jill, Paul and Dorothy Sacca of Grand Isle School used paper circuits to have their students model energy saving solutions as part of their STEM Curriculum. ust last month, I had the opportunity to collaborate with teachers at Crossett Brook Middle School who had recently been inspired by one of Jill’s presentations, to design a maker-centered learning activity where students used paper circuitry to illuminate a statement on human rights. A quick internet search will yield hundreds of maker projects using paper circuits, and with the guiding hand of a talented educator, this very accessible maker activity can provide so many opportunities for integrating making across the curriculum. One of the reasons I like paper circuits so much as a maker activity is that it falls into what MIT professor Mitch Resnicks calls a “Low Threshold, High Ceiling, Wide Walls” activities. and paper circuits provide opportunities to grow skills in ways you can’t imagine due to its high ceiling. All it takes is a look at Jill’s blog to see where she has taken the skills she started learning at Create Make Learn only a few years ago. Every year Jill grows her own skillset with paper circuitry and routinely connects with other paper circuitry enthusiasts through connections with Nexmap and the 21st Century Notebooking community. Her work with paper circuits has grown to include sensors, code, and even the Internet of Things. Her most recent project, an internet-connected story book, can receive real-time data to trigger circuits which animate and illuminate artwork inspired by her daughter’s poetry. 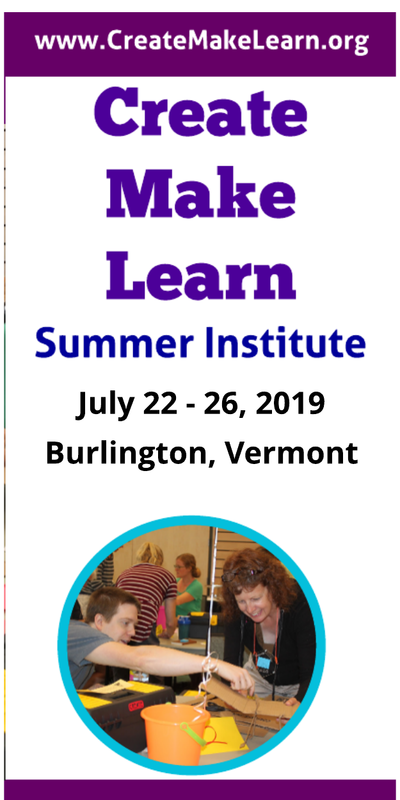 I’m so glad educators will get a chance to learn from Jill again this summer at Create Make Learn Summer Institute. Perhaps you’ll get to learn from her, too! Their is even an early bird incentive for those who register this month. Day 17 Meet Toad- Bobbie's Art in Tow!